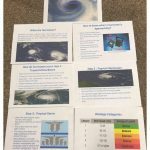 One of our home-schooled children has been busy working on a Science project all about Hurricanes. A hurricane is a huge, rapidly rotating storm. When winds reach 74 miles per hour, a hurricane starts off. Hurricanes can be up to 600 miles across and have strong winds of up to 200 mph. Hurricanes occur with extreme weather conditions. The project focused on what Hurricanes are and how to react if one approaches..